Configuring your router’s wireless security settings ensures that your wireless network is safe from unauthorized access. 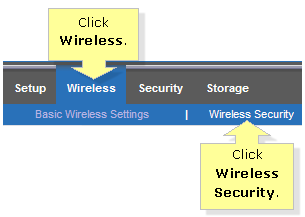 This article will guide you on how to configure the wireless security of your Linksys router. IMPORTANT: Make sure that your computer is connected directly to your router using an Ethernet cable before proceeding. Open any web browser. 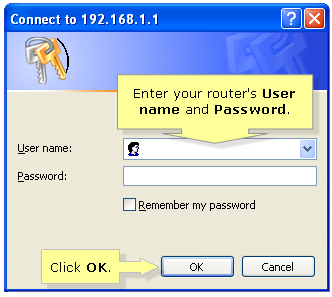 Then, enter your router’s IP Address in the Address bar, then press [Enter]. NOTE: The default IP Address of Linksys routers is 192.168.1.1. Enter “admin” in the Password field then leave the User name blank. If you have set up a User name and Password for your Linksys router before, enter your personalized credentials instead. 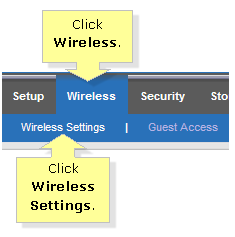 Once done, click OK.
QUICK TIP: For Linksys Smart Wi-Fi Routers, you can enter “http://myrouter.local” in the Address bar to access its web-based setup page. If you used Linksys Connect in setting up your router, you can open the software to retrieve the log-in details. To do this, go to Router Settings > Advanced Settings on the Linksys Connect software. If in any case the User name and Password that you have entered are not accepted or if you forgot your log-in details, you can reset the router by pressing the Reset button at the back or bottom of your router using a pen or paper clip for 10 seconds. Then, unplug the router from the power outlet for 30 seconds. However, you have to reconfigure the router to be able to go online again once you perform a reset. To learn how to set up your router using Linksys Connect, click here. You will then be redirected to the router’s Classic web-based setup page where you will configure the router’s wireless security settings. If you are using a Linksys Smart Wi-Fi Router with the Linksys cloud account, click here instead. Click the Wireless tab then click the Wireless Settings sub-tab. Under the Configuration View section, click the Manual radio button. Security Mode – For better security, WPA2 Personal is the recommended security mode for your wireless network. Passphrase – This is a set of characters that you need when connecting your computer or other devices, such as smartphones and wireless printers, to the network. You will only be able to set a passphrase once you have selected a specific security mode. SSID Broadcast – Clicking on Disable will only turn OFF the broadcasting of your main wireless network’s wireless network name (SSID). To disable the SSID broadcast of your Guest network, click the Guest Access sub-tab and look for the SSID Broadcast option. You should now have successfully configured your router’s wireless security settings. Click the Wireless tab then click the Wireless Security sub-tab. Select your preferred Security Mode and enter a corresponding passphrase in the fields provided. QUICK TIP: Some routers may be dual-band, so you can set different passphrases for your 2.4 and 5 GHz networks. Other wireless security options like the SSID Broadcast can be accessed by clicking on the Basic Wireless Settings sub-tab then clicking the Manual radio button. To improve wireless security for your network, you can combine various security methods on your router. This helps ensure optimum security for your wireless network. Click on the link below to know how. The Guest Access feature on your Linksys router is another option for you to secure your network while providing Internet access to your guests. This feature is enabled by default. Click here to learn more about the Guest network.